Scorpion Fasteners Exterior Coated decking fasteners are the perfect addition to your outdoor living space. If you are constructing a deck out of today's pressure treated lumber or one of the latest line of composite/PVC decking, we have the right fasteners you need to do the job right. All of our decking fasteners are AQC rated and with our "Draw-Tite" shank ensure a long lasting secure deck fasteners experience. When ultimate protectection is needed around water and tannin acid wood applications, contractors know they can rely on consistency of performance of Scorpion’s stainless steel fasteners in today’s pressure treated wood, hard wood and composite applications. 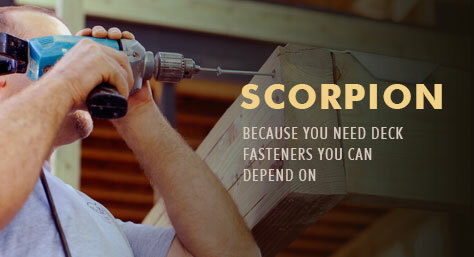 Scorpion is technically correct, with the right tools and fasteners for the jobs mean speed and ease of installation- every time.